The online version of Exchange—Office 365—does not possess an easy PST conversion functionality. 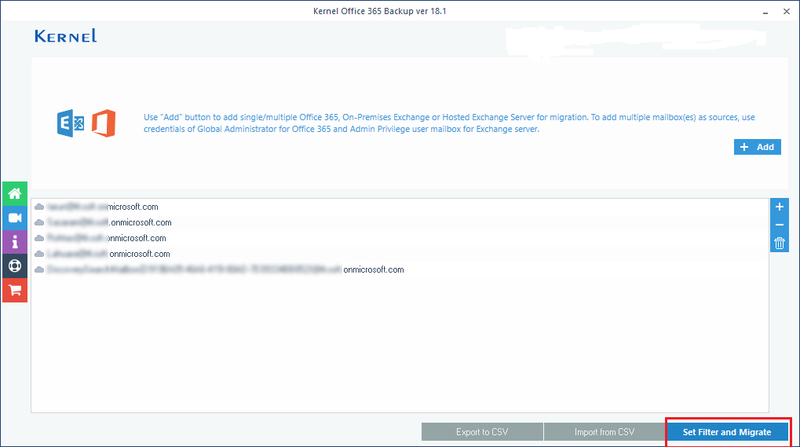 However, a tool like Kernel Export Office 365 to PST Tool helps you backup Office 365 mailboxes to PST files. So, exporting Office 365 Mailbox items to Outlook PST is not an arduous task anymore. 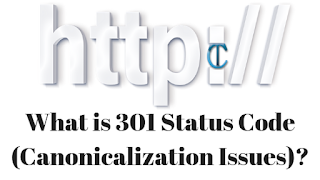 With this tool, the all mailboxes or selected mailboxes can be backed up. Its advanced search features let you back up the mailbox data selectively too. 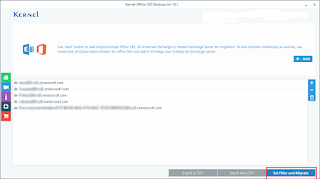 The software does not require Outlook installation for saving Office 365 mailboxes to PST files. Important items like messages, contacts, and attachments can be backed up using its revolutionary backup mechanism. Export in Simple Steps-There are only four steps for Office 365 backup namely Source Selection, Filter Application, Destination Selection and Migration. The tool is convenient to use, and it does not require any technical expertise for the person to use it as the software has an interactive interface. Export all Exchange data- In addition to primary mailboxes, the tool is provided with the functionality of exporting archive mailboxes and public folder to PST files. Prevention of data duplication during mailbox export-This smart tool averts duplication and redundancy of data during export. When you export mailboxes for a second time, only the additional information is exported. Performs multiple export jobs concurrently- This tool can perform numerous export jobs at the same time. The export tasks are processed paralleled without interference from each other. This saves human labour and time. Feature to bypass time-consuming items- The Export Office 365 to PST tool is integrated with a timeout feature that allows to specify a time limit for the export procedure. Maximum time that can be allotted for an export is 20 minutes. Files and emails of large size when fail to get exported within the stipulated time duration, their export gets averted. 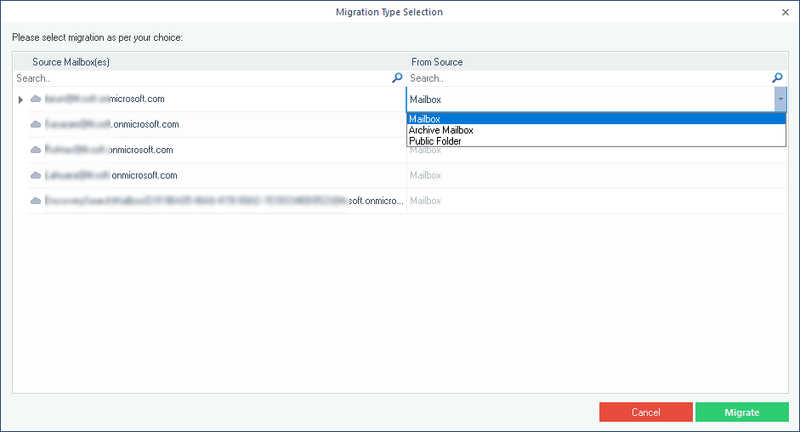 Save mailbox hierarchy to a new PST folder- A key highlighting feature of this tool is its embedded functionality to save Office 365 and Exchange Server mailbox folders to specified folder with complete hierarchy. 1.Add the Office 365/ Exchange Server as the source. 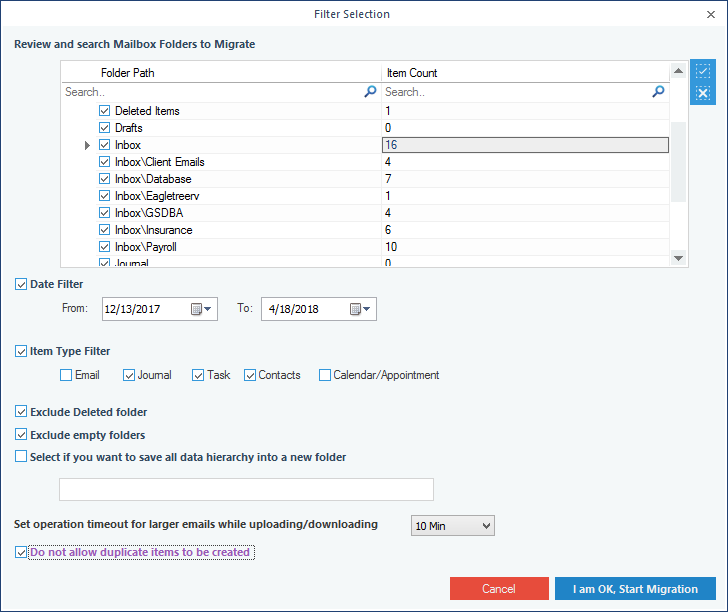 2.Choose the data you want to export - Mailbox, Archive Mailbox, or Public Folder - and click on 'Migrate' button. 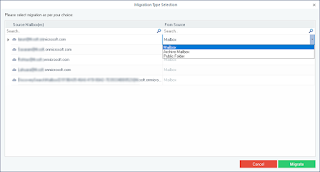 3.Tick the filtering options as required in the Filter Selection window and click on 'Start Migration'. 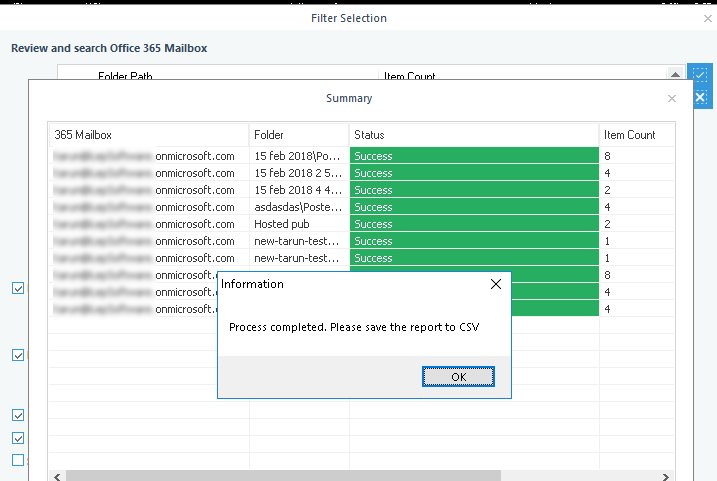 This tool filters the Office 365 and Exchange data Folders, Date Range, and Item Types. 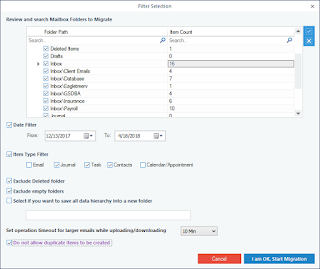 This new-age tool comes with multiple options like Exclude Deleted folders, Exclude Empty folders, Save folder hierarchy, and many other options. 4. A notification window is popped up as soon as the migration process gets completed. 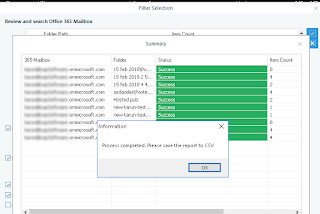 Click 'OK' and save the report as 'CSV’. Windows OS Platforms - Windows 10 and all below windows versions.